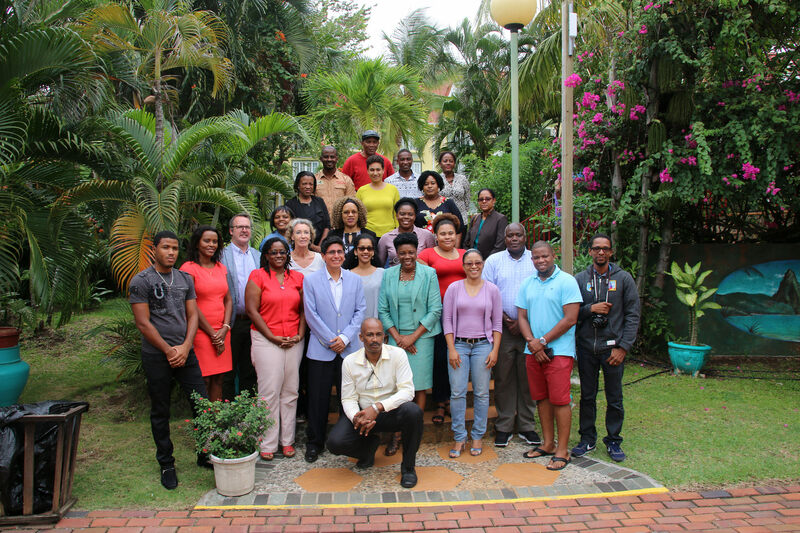 Participants in the June 2017 workshop “Understanding Climate Change Adaptation in the Saint Lucia Context: A briefing for journalists” in Castries. *Download the brief from the right-hand column. For more on strategic communications in NAP processes, visit the NAP Global Network website. Countries preparing for climate change impacts are formulating and implementing National Adaptation Plan (NAP) processes. Saint Lucia has developed a NAP document that sets out a 10-year plan (2018 to 2028)—consisting of both cross-sectoral and sectoral measures—to enable and stimulate climate change adaptation in all development sectors and areas and at all levels of society. As a small island developing state, Saint Lucia is highly vulnerable to the impacts of climate change. By one conservative estimate, the cost of inaction on climate change in Saint Lucia could equal 12 per cent of the country’s GDP by 2025, increasing to 24.5 per cent by 2050 and 49 per cent by 2100 (Bueno et al., 2008). Building on an earlier overview brief on strategic communications for NAP processes, this sNAPshot highlights a selection of communications activities and best practices that the Government of Saint Lucia—led by the Department of Sustainable Development (DSD), and with support from development partner agencies including through the NAP Global Network’s U.S. In-Country NAP Support Program (US NAP SP)—has undertaken to raise awareness of the need to adapt to climate change. The Government of Saint Lucia has a strong track record of effective communications campaigns on climate change. Notably, the “1.5 to stay alive” campaign aimed to raise awareness of climate change in the Caribbean and was launched at the 2015 UN climate change conference in Paris, the 21st Conference of the Parties (COP 21). Building on the Government of Saint Lucia’s experience in communicating about climate change, DSD worked with the NAP Global Network to develop Saint Lucia’s Climate Change Communications Strategy Under the National Adaptation Planning Process. Developed with the input of key stakeholders, this communications strategy sets out communications objectives for the NAP, its priority audiences, key messages for priority sectors, channels of communication, and options for monitoring and evaluation of communications efforts. This strategy was finalized ahead of the launch of Saint Lucia’s NAP document, and implementation of the strategy is underway. As part of the communications strategy, the Government of Saint Lucia developed the website Climate Change in Saint Lucia (www.climatechange.govt.lc/) to share news, events and key policy documents related to climate change mitigation and adaptation, including the NAP process. The website is designed to appeal to diverse national and international audiences, containing summaries of the NAP and Sectoral Adaptation Strategies and Action Plans (SASAPs), multimedia such as music videos and animated videos, as well as news items and technical documents. DSD staff have also been trained on web management to ensure that the site can be maintained internally going forward. The DSD promotes content through (among other means) the Sustaining Saint Lucia Facebook page. The Government of Saint Lucia has continuously worked to foster a dialogue on climate change issues with national journalists. Ahead of COP 21, the Government launched the “Saint Lucia Media Climate Change Challenge,” which encouraged private media to report on climate change and sponsored a trip to COP 21 for the winning journalist. In August 2017, the Department of Sustainable Development partnered with the NAP Global Network to host a briefing for Saint Lucian journalists on climate change adaptation to advance the conversation on how to effectively communicate climate change to Saint Lucians. The day-long workshop was attended by journalists from print, broadcast and online media, helped foster dialogue between government officials and journalists, and was a space for open discussions about the opportunities and challenges of reporting on climate change issues. Government of Saint Lucia colleagues also undertook media training through the U.S. NAP SP to build their capacity to speak about climate change to the media. The Government of Saint Lucia has also identified a number of charismatic spokespersons to champion climate change adaptation. Ahead of the 23rd Conference of the Parties in 2017 (COP 23), DSD produced a series of “Fight Climate Change” Public Service Announcements featuring government and civil society spokespeople explaining key issues that would feature at the upcoming UN climate change conference. The Government of Saint Lucia has also partnered with Saint Lucian creators (artists and performers), who have produced creative works in many mediums to raise awareness of climate change issues. One example is the Lucian Calypsonians’ music video “ACT NOW Saint Lucia” that was produced through the A.C.T. Now Saint Lucia program undertaken by the United Nations Development Programme (UNDP), in partnership with the Government of Saint Lucia, and with funding support from the Government of Japan through the Japan-Caribbean Climate Change Partnership (J-CCCP). A special session for creators was also held alongside the launch of the NAP document in April 2018, in an effort to further cement collaboration between the government and the island’s artists on communicating the urgent need to address climate change. The Saint Lucian Government developed a logo created by local artist Alexandra Grant to act as a recognizable brand for the NAP process. The logo is being used alongside the Government of Saint Lucia crest on related policy documents and initiatives to create a local visual identity for climate change adaptation. Saint Lucians participated in Knowledge, Attitude, Practice (KAP) surveys in 2005, 2007, 2011, 2013 and 2016 that collected data on public awareness and practices related to climate change adaptation. These KAP surveys provide valuable baseline data against which to measure the effectiveness of the government’s ongoing communications efforts through follow-up surveys. Read more about "1.5 to Stay Alive"